Check Google Maps for the route description. 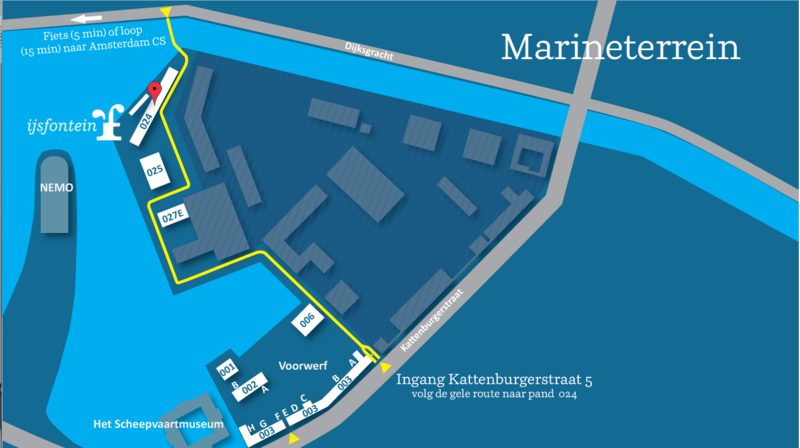 The entrance of the Marineterrein Amsterdam is Kattenburgerstraat 7. Follow the yellow path (see map) to IJsfontein. We have 5 parking spaces available. Reserve a spot in advance by sending an email to info@ijsfontein.nl. 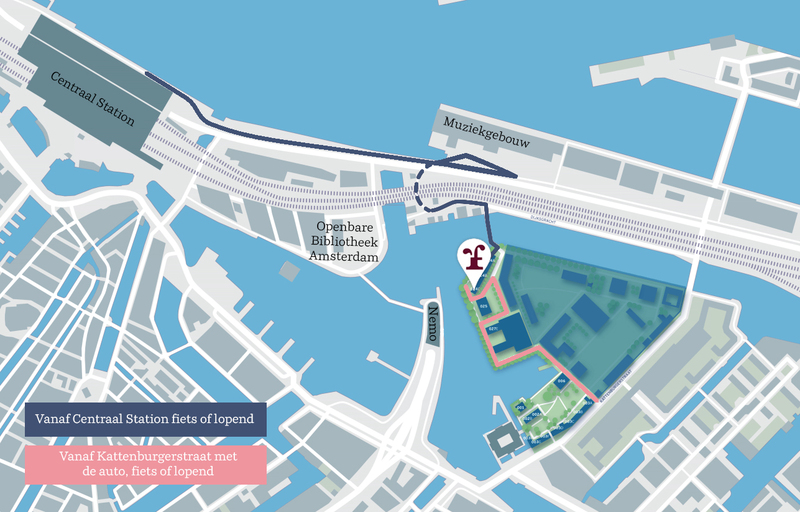 You can also park in the Piet Hein garage or in the Kattenburgerstraat. From there it’s a 10 to 15 minute walk to IJsfontein. Follow the blue line in the image below: Leave the station through the back. If you see water instead of loads of buildings it means you are in the right place. Take a right and follow the Piet Heinkade until you see the Mövenpick Hotel on your left. Take the footpath down and take a left. You’ll see the water on your right and the Delirium Café on you left. Take a turn left and follow the road under the overpass. At the end you’ll find a street called ‘Dijksgracht’. Take a left and follow the road until you see a small bridge on the right. Cross the bridge. IJsfontein is located in the long red brick building. Just follow the water and you’ll find our entrance on the far side of the building. It can be a bit tricky to find us, watching this 34 second video will save you a lot of time! Check 9292.nl or ns.nl for timetables. Read more about the Marineterrein.